Watching X games on ESPN and playing Dave Mirra Pro BMX on PS1. Pretty much anyone I ride with or have ridden with at any point influence me in certain ways! Jason Watts, Boyd Hilder, Harry Main, Kyle Baldock to name a few that highly influence me though! After my usual sleep in til about lunchtime I’ll get up and head to the local or wherever everyone is riding and then from there we might hit some other parks or just chill at the local all day! 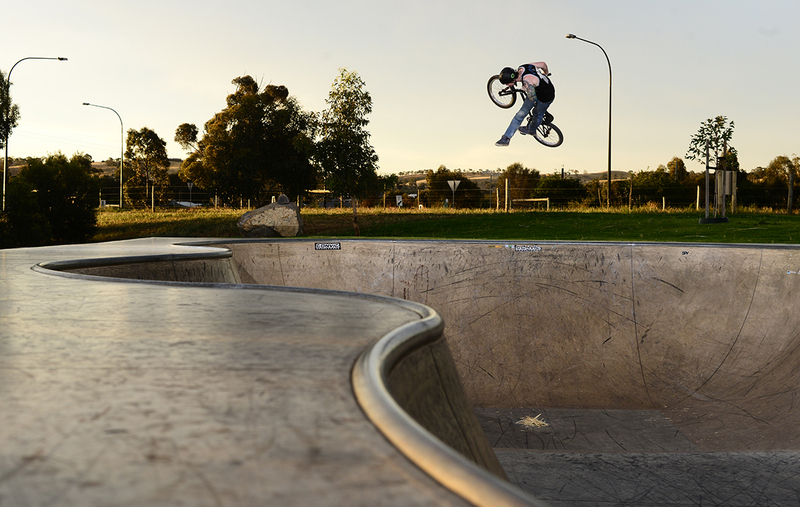 Belconnen is definitely one of my favourites, but also all the other skateparks in Canberra are amazing! Anywhere on the Gold Coast, there’s so many good parks up there! And lastly the Adelaide city trails are so fun! Snakes have always interested me and I’ve recently started keeping them, I have 4 at the moment! I also enjoying playing up on the weekends with mates, and getting tattoos! There’s not a lot of riders out my way but usually we get most of the riders to meet up and ride wherever, always a good laugh and fun people to ride with! Seeing crazy web edits usually gets me motivated or just knowing that I’m gonna ride a fun park or with good people gets me pumped! I haven’t travelled out of Australia yet so I would say probably the Gold Coast. It’s just so nice up there! I could easily live off Hawaii 5.0 wraps from Schnitz! In Hearts Wake, Parkway Drive, Amity Affliction, The Ghost Inside, Karltheband. Probably Wasp Hubs because they sound amazing! BMX has taught me so much! I try to live my life the way I ride my bike; Care free and doing whatever the hell I want haha. Shout out to Jason at LKI clothing for always keeping me freshly clothed, Clint Millar for being a badass boss man, Cooper Brownlee for taking me on riding trips and always getting sick clips and photos, Dunny and Alex at S&J cycles for always dialing my bike in, Polly for being one of dem boiz! Choofy lad for always being a laugh at the skatepark, and Nathan Charles for being my mentor when I first started riding, R.I.P! !